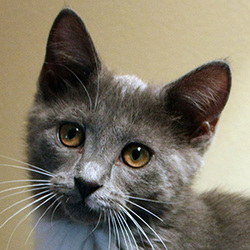 Hazel, as she was originally named, was born at the shelter on May 19. 2011. Her mom arrived there pregnant and before her foster mom came to collect her, she went into labor and had 6 beautiful little kittens, 3 boys and 3 girls. When they were about a month old, the foster mom had to go out of town for several weeks so I agreed to take them. I also got the opportunity to name them. Since their mother's name was Electra, I decided to name them all after characters from the play, "Mourning Becomes Electra". They stayed far longer than originally anticipated because when they were ready to go back to the shelter and be adopted, there was no room for them due to the influx of kittens and the lack of adoptions going on at the time. It was during that extended stay that Hazel won me over and I decided to keep her. I was able to complete the adoption on September 11, 2011 during an Adopt-A-Thon at PetSmart which enabled the shelter to get an extra $35 donation as a result. Hazel's name, while cute as part of the "theme" of the litter, is not one I was fond of keeping as a permanent member of the household. For one thing, you'll notice that all my other cats have names of Celtic origin. Plus, every time I think of Hazel, I flash back to the frumpy housekeeper from the 1960s. I blogged about changing her name and even posted a list of names I was considering and gave people an opportunity to vote. There was a three way tie between Arwen, Vivian and Ainsley. In the end, I went with Arwen. Currently Arwen and Caitlyn are not exactly the best of friends. Caitlyn hisses, growls and smacks Arwen around. She's done it so much that Arwen, at first just trying to present the passive, "I'm not a threat" position, now growls and bats at Caitlyn. So, I had the girls spend some "quality time" together in the former kitten room. One in a cage, one free roaming in the room. I would alternate which one sits in the kitty "jail" each day. Each evening, they would spend some time together free roaming in the room with me and my clicker and some treats trying to get them to accept the presence of each other. It's been slow going. While there was some progress, eventually it got to a point of diminishing returns so now both run freely in the house 24x7. Sleeping arrangements were in flux for some time after Arwen had free reign in the house. Sometimes Caitlyn would sleep with me in her usual spot, sometimes at the foot of the bed and sometimes in a kitty bed under my bed. Mostly Cait sleeps on my chest/torso with occasional visits by Arwen down around my legs. However, Caitlyn is quick to let Arwen know she's not welcome if the two are in close proximity. Hopefully they will eventually both settle down and learn to play nice with one another. For now, however, Caitlyn seems to be of the opinion that if the children from the Village of the Damned had had kittens, that Arwen would be the pick of the litter (shamelessly stolen from the Sylvia cartoon). At least the boys have adapted well to her. Arwen and Galen regularly play together and, if she offers him the top of her head, he will start licking her. Duncan even responds occasionally with some head licking when she made the gesture in front of him. Usually he will tap her on the head with his paw and run away. Arwen has also decided that it's fun to visit me in the shower. She'll sit on the side of the tub and meow pitifully at me begging for attention. Or she'll try walking around the edge, licking up water. On occasion, she'll even jump down into the tub for a few seconds. Usually, by the time I am done showering, she's pretty soaked. But she loves being toweled off so maybe that's the inducement to getting covered in water. Her other trick is opening and closing the master bedroom door. Twice she's also tried that trick on the downstairs bathroom door only to lock herself inside.